these are the books that I read over and over. tirelessly, joyfully. these are the books that I loved so much it hurt. 1. maria tallchief by tobi tobias. purchased in first grade at the school book fair and the beginning of so much for me. filled with gorgeous pencil drawings of a dancer who was born on an indian reservation and went on to become a famous prima ballerina with the new york city ballet. I spent hours examining the drawings. hours and hours and hours. and even though I have long since parted ways with ballet, I still want to slip inside this book and become maria tallchief. 2. peppermint by dorothy grider. a litter of kittens is born in the back of a candy shop and all of them find a home but one-- a sickly little white kitten named peppermint. oh the heartbreak! I could not take it. which is probably why I read it again and again. also? pictures of pretty candy in big glass jars plus pictures of fluffy kittens= total win. 3. little majorette by dorothy grider. baton twirling was never really my thing but the pictures of the costumes in this book had me reconsidering. oh, that bright red two-piece number with the white fringe! and the fancy majorette costume that patty's parents surprised her with at the end! SO. GOOD. 4. I know a story by miriam blanton huber, frank seely salisbury and mabel o'donnell. pretty much your basic collection of classic tales here-- i.e., the gingerbread boy, the three little bears, little red riding hood, yadda yadda yadda. but the last story in the book, the boy who went to the north wind, was something special. there was a magic stick and a magic goat and a magic tablecloth and wind that actually talked and a boy and his mother who had nothing but got everything in the end. the best, people. the best. 5. popular party games edited by alison m. abel. 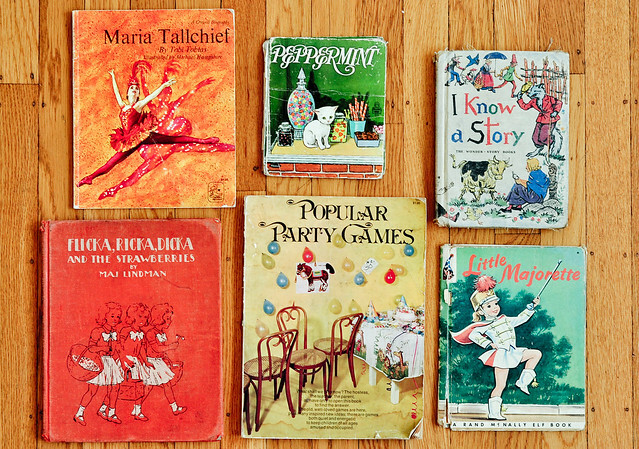 purchased at the school book fair in second grade and the very beginning of my lifelong obsession with party planning. there's a price tag on the front with 30 cents marked on it and the initials A.C. scrawled next to it. which means I must have tried to sell this book at one of my mother's many garage sales. which, if it had actually sold, would have been nothing less than tragic. there are important sentences underlined and specific game titles circled and entire paragraphs crossed out. it's a little piece of second grade andrea and I die when I think of how easily it could have ended up in someone else's attic. 6. flicka, ricka, dicka and the strawberries by maj lindman. checked out from the local library repeatedly and then purchased at an antique mall somewhere in tennessee a good twenty years later. to be clear, I loved all the flicka, ricka, dicka books. all of them. I was also a big fan of the snip, snap and snurr books. because please. old-fashioned storybooks about swedish triplets are meant to be adored. however, this particular flicka, ricka, dicka book just about did me in. every time. the story: flicka, ricka and dicka (in adorable matching red and white dresses, mind you) go on a picnic in the woods. along the way, they fill their baskets with wild strawberries which their mother has promised to pay them each a silver coin for. at some point, they lose track of time and end up horribly lost. which is when they stumble onto a sweet family who takes them in. fyi, this family has nothing. they're walking around in ratty clothes and bare feet so in my 7 year-old mind, they have nothing. but you know, the mother keeps the tiny home clean and clearly, they're kind, humble people. the kind of people that just sort break your heart. so anyway, the mother sends her daughter (who just happens to be the same age as flicka, ricka and dicka) back into the forest to help the triplets find their way back home. when they return, the triplets tell their gorgeous (blonde) swedish mother everything. they tell her they want to use their silver coins to buy the girl a new dress and there's a whole page devoted to the shopping (which I loved) and of course, they pick out the most perfect dress ever-- crimson red with white polka dots and a little white lace collar. in the end, they take it to the girl, along with a basket filled with apples and jars of strawberry preserves and milk for the baby (who you just know was starving) and oh people, it was beautiful. and I don't remember crying but I bet I did. I just bet you I did. I almost cried when I saw "Little Majorette" again! Oh how I loved that book. And it was because of the illustrations. They captured my four year old mind and I've never forgotten them. Isn't there a picture of her in a parade with boys in their peddle cars? And maybe one with a bakery? I haven't seen that book in at least 30 years and still remember all that! little majorette! holy cow, i had totally forgotten about that book but that cover took me on a little timewarp journey. So delightful. Do your kids love those books? Wish I had kept some of mine. I LOVED Peppermint as a child. It's probably the most beat up storybook I have from my childhood - mainly because I remember reading it over and over. So sad I've never seen the others. Maybe I'll have to check out Powell's and see if they have them in stock! DArn it, just saw that my husband was signed in for that last comment. Sorry! I just watched a documentary last night--The Ballet Russe. That is where Maria Tallchief got started. She was in it. Spectacular! I don't know how I never knew about your blog before but I am SO glad I stumbled across it today. beautiful, magical, wonderful, gorgeous! "Books that you read as a child, affect you and become a part of you, and who you are going to be more than any other reading in your life...and I...I have gotten carried away"
I also loved (and still have) Peppermint!! I am so grateful that my mom kept all of our childhood books because it's been wonderful reliving them with my boys. i'm 48 and i STILL re-read my favorite childhood books-usually in the summer, cause summer is all about being a kid. Such a sweet collection of books. Do you still own these? When I was a little girl I was also crazy for the ballet. I spent many an afternoon at the public library pouring over every book that they had about the ballet. I would have loved Maria Tallchief. As a matter of fact, I would like to read it now. I have three greatnieces now. Maybe I will look up some of these for them. I can swear that I remember the little majorette translated into hebrew. I know this cover! the world is small and we are all so much alike. Oh, the Peppermint kitten book!! That was one of my favorites from when I was a little girl... I couldn't remember the author- and searched for it online for my own daughter when she was kindergarten age... Needless to say, I had no luck. I CAN NOT believe that I've never heard of a single one of these. We grew up ten years apart, but apparently, that makes a big difference. Now I'm off to search for some of your faves. You've made me curious. Oh, yeah! I almost forgot. There is a statue of Maria Tallchief in Tulsa that is remarkable. If you want, I'll send you my pictures of it. It's actually an amazing ring of bronze sculptures of ballerinas in their own iconic role. I think you would love them. Actually, I am eager to go back now that I know more about photography. I was the model for the "Little Majorette" written and illustrated by Dorothy Grider. I was 8 yrs old at the time. Dorothy used my medals and costumes as well as my twirling skills. The little boy in the book was my younger brother. I have the original proofs and one of the first copies. Dorothy is 95 yrs old living in my hometown of New Hope,PA. We communicate regularly. oh my goodness! the model for the little majorette book? my little girl self is absolutely thrilled you found your way here! so many fond memories of that book!